Reward charts with cars and trucks! Kids will have loads of fun working on improving behavior with their favorite vehicle behavior chart. Our behavior charts with cars and trucks can work wonderfully as behavior charts, chore charts, star charts or even potty training charts! 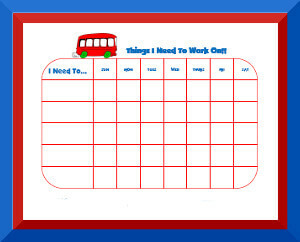 Also visit our page of Thomas the Tank Engine Behavior Charts, Sports Behavior Charts, Step BehaviorCharts, and Medieval Behavior Charts. You can use the "comments" space to list rewards earned or comment on how the week went. As always, drop us a line if you'd like a vehicle that you don't see here!